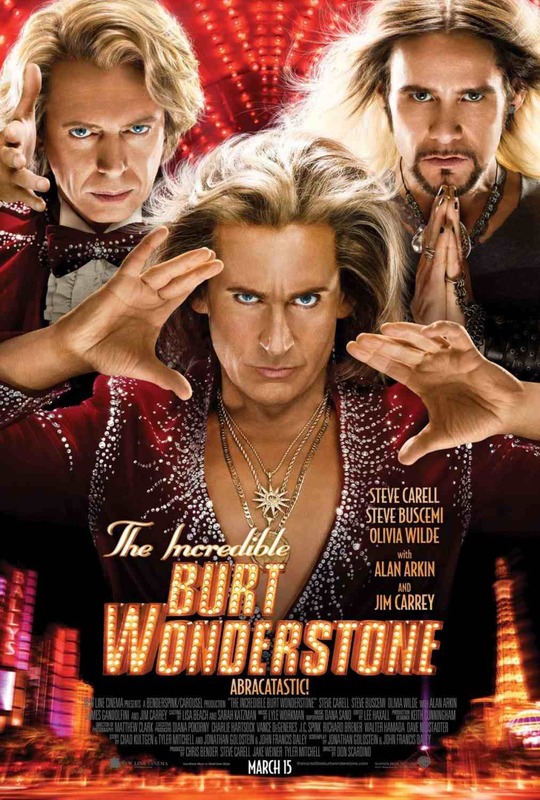 The Incredible Burt Wonderstone opened today, and it was incredible…that I was there to see it. With an all-star cast how bad could it be? Sit down, let me tell you. Burt Wonderstone (Steve Carell of Get Smart) grew up doing magic with his best friend Anton Marvelton (Steve Buscemi of Fargo). They make it big in Vegas doing the same sequined jacket act they learned from a Rance Holloway (Alan Arkin of Little Miss Sunshine) magic kit for 10 years. I was happy to see Olivia Wilde (Cowboys & Aliens) join the act as their assistant so this movie would not be a complete sausage fest. Finally, Jim Carey (Bruce Almighty) shows them up as Steve Gray, the “Brain Raper,” with his street magic and death-defying feats. Now the Incredible Burt and Anton Show really looks lame, and the growing rift between Burt and Anton explodes. They are fired from their Bally’s gig by Doug Munny, played to perfection by James Gandolfini (The Sopranos). I told you there are a bunch of stars in this movie. I love Steve Carell and Jim Carey, and I had trouble counting how many times they made me laugh. Probably because you need the first laugh to actually start a count. I smiled when I saw Jay Mohr (Jerry McGuire) playing “Rick the Implausible,” and he made me chuckle as at least he brought something to his character. Carell gave the same deadpan look I have seen in most of his work for an hour and forty minutes, and Jim Carey played… Jim Carey. The script seemed to consist of dozens of corny cliché bits knitted together with short scenes of, “What just happened?” I didn’t have to pull the string, as the whole thing unraveled on its own thanks to the poor direction of seasoned TV director Don Scardino (30 Rock). The next time you step away from “30 Rock” Don, you should bring Tina Fey with you. On a good note, it wasn’t the worst thing I have ever experienced, and that puts it above my colonoscopy and the Carter Administration. I wanted to believe in magic. I wanted to laugh, and I wanted to feel something for these characters beyond pity, and perhaps disdain for their agents for booking them in this stinker. I give this movie 1 star out of 5, and that’s for Alan Arkin and Jay Mohr who don’t need adjectives in front of their names, or this movie on their resume.